The Pretty Dish – A Sneak Peek Video! 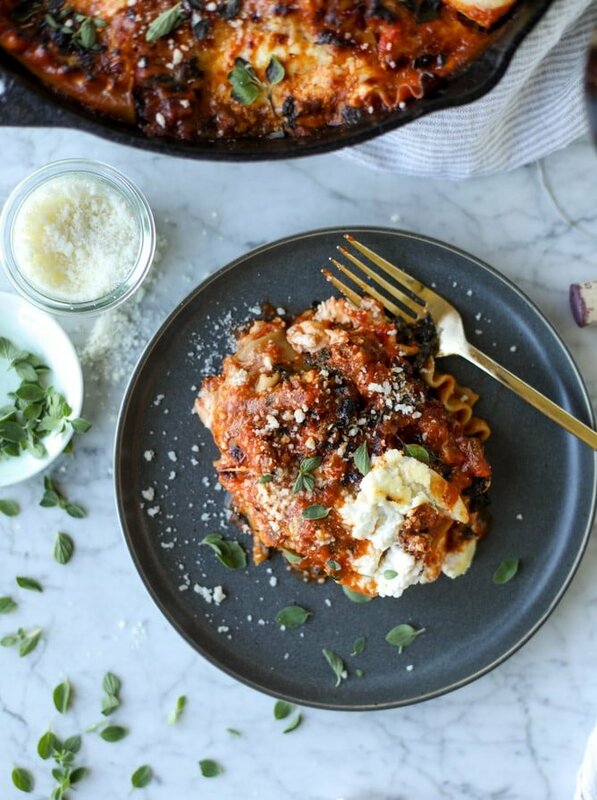 Oh my gosh, lasagna is one of my comfort foods and I love that this one is semi-healthy! This sounds amazing! 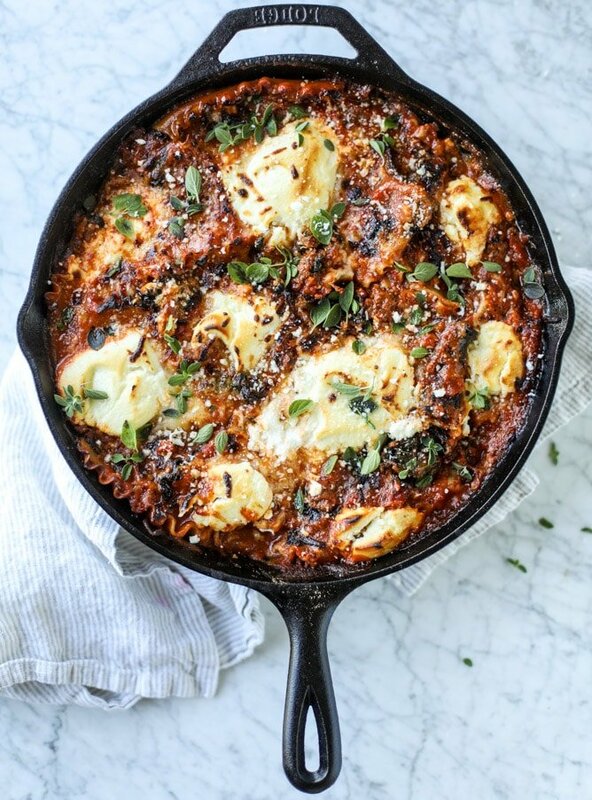 I also love the idea of skillet lasagna because a whole casserole is always way too much for a 2-person family. 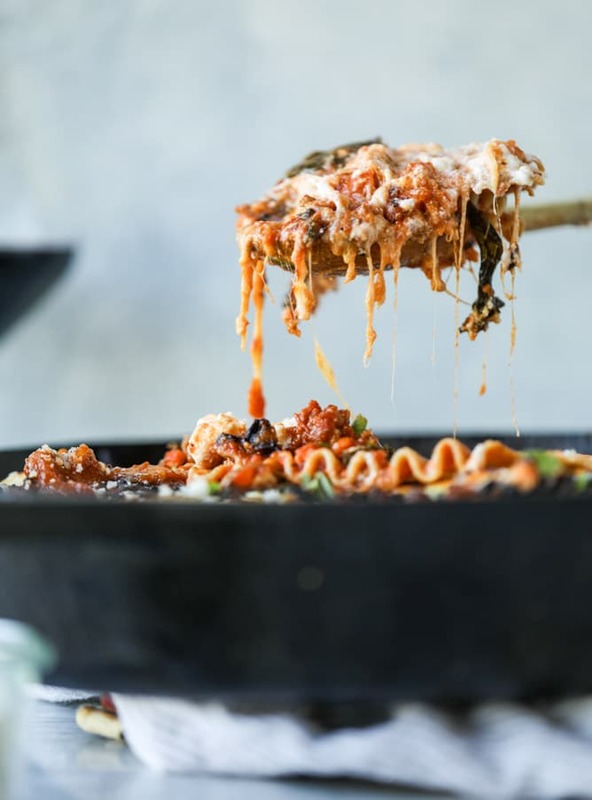 I make your orig skillet lasagna a few times a year (which is a lot for me) – can’t wait to try this one! YES! I need this for dinner tonight! 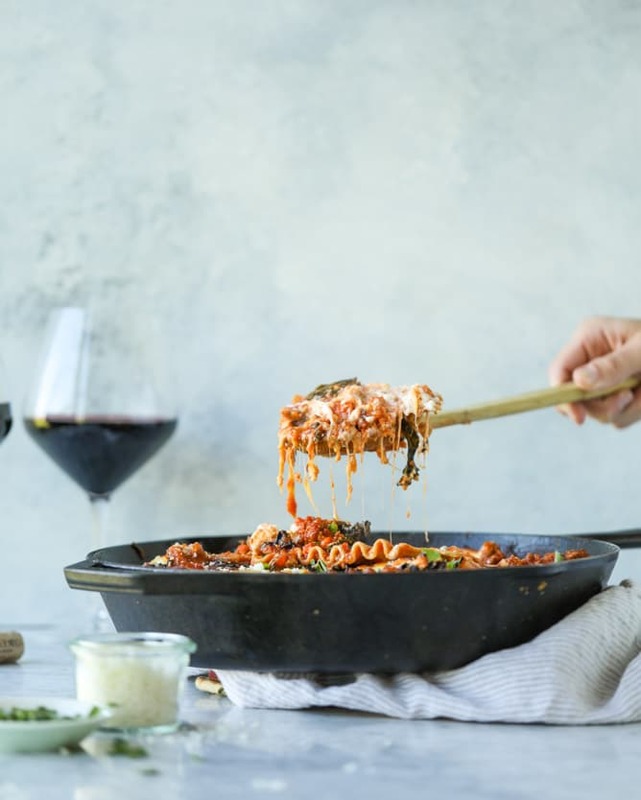 100% making this tonight (with veggie sausage). It looks so good! Perfect for all this cold weather. Looks very tasty! Though it may seem to be a heavy dish especially during the post-holiday time, I like it very much. i think you can! i’ve never tried it. you’d probably want to salt them first and let them rest for 30 minutes to remove some of the liquid so they don’t add liquid to the skillet! Had this last night for dinner, it was awesome! My 20 month old ate up every bite including the kale. This was so good! I didn’t have lasagna noodles on hand, but it was an awesome pasta bake with whole wheat spaghetti! Omg, I made this from the Sweet Peas Meal plan last week and it was to die for. Definitely a keeper. This looks phenomenal!! I love me a good cast iron skillet meal. 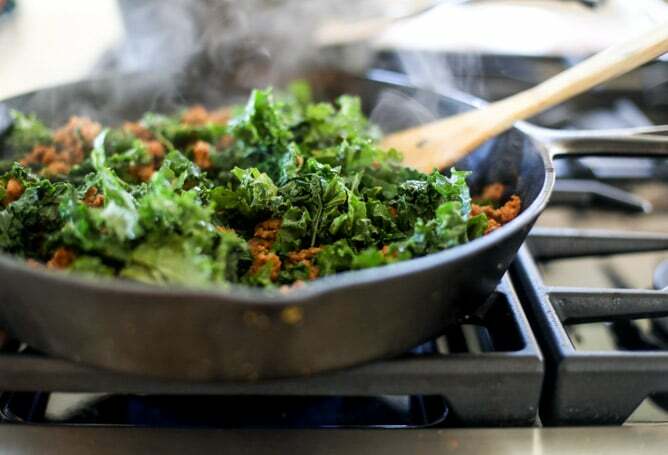 Kale evens out the pasta too, right? Yummy! 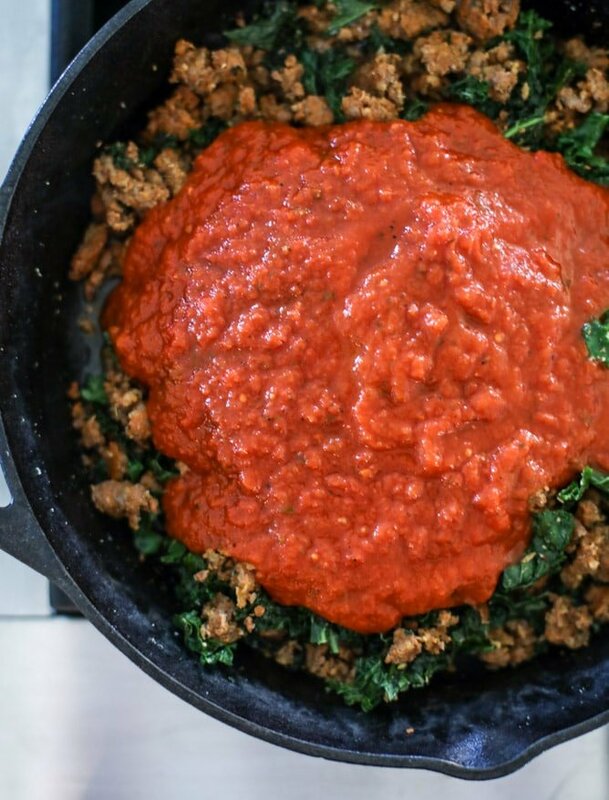 Made this tonight for a cool weather meal and subbed the sausage w/ lean ground turkey and just a bit more mozz. Absolutely amazing. Thank you for this!!!! Will definitely be making again and have plenty for another meal for two! This looks fantastic and it’s on the menu for tonight! 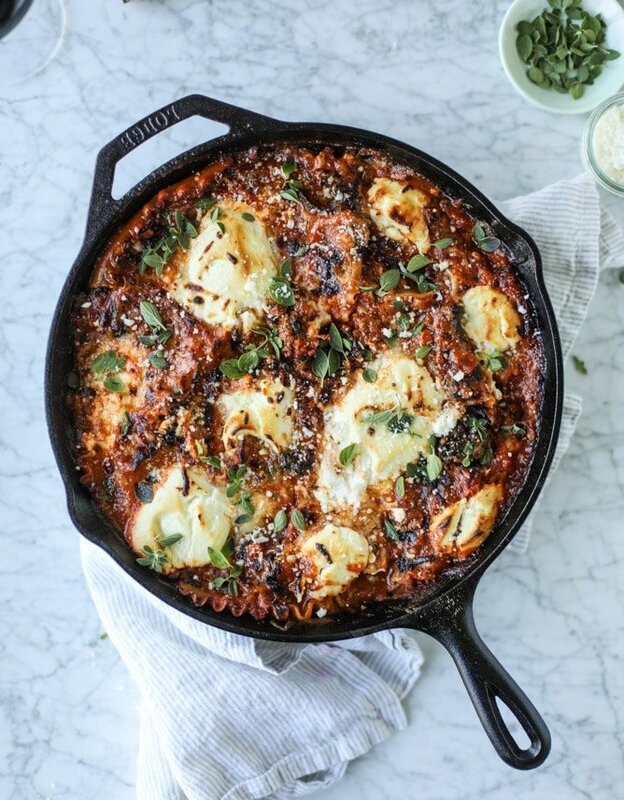 Quick question…what size cast iron skillet is that you’re using? Don’t want to run out of room for all that goodness! thanks sheri! mine is a 12inch skillet! 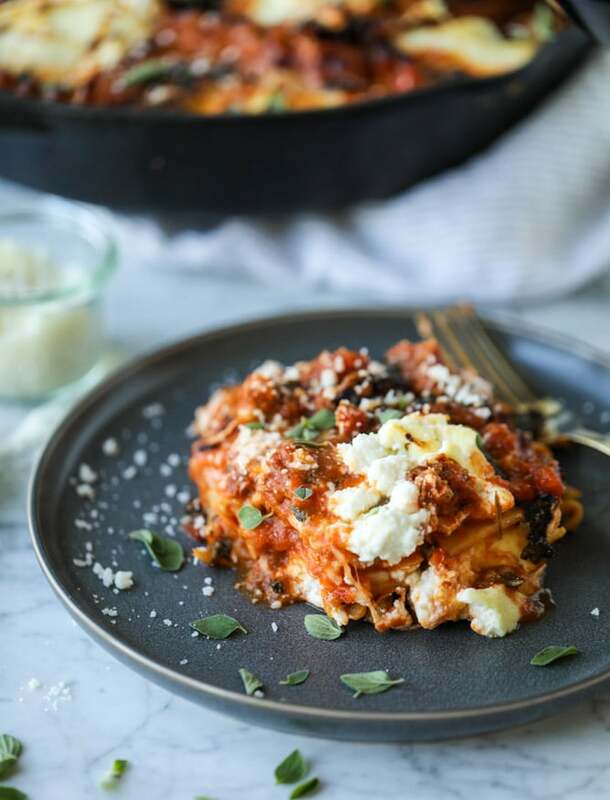 very similar to baked ziti…. hi! mine is a 12-inch! Made this tonight, so so good! I used some random noodle that we had and sliced a medium zucchini lengthwise and put it on the bottom. We did have to go to the store for cheese, but I had everything else on hand (zucchini and kale from the garden). I also used ground pork and added Italian sausage seasoning to it. 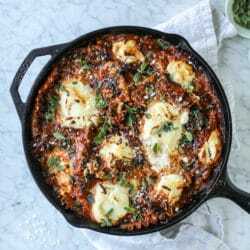 This could be fun with pepperoni and olives maybe, like a pizza skillet?